Anand Krishna is a interfaith spiritual activist. He tirelessly voices and promotes the universal values on innerPEACE, communalLOVE, and globalHARMONY to reach his vision of One Earth One Sky One Humankind. He was born in Solo, Central Java from Indian Heritage parents, but regards himself as Indonesian first and foremost. He was educated at Pacific Southern University, USA and received MBA degree, and worked as Marketing Director at Sainath Group of Companies, Indonesia from 1979 till 1986, and as CEO at D’Jar Inc, USA from 1986 until 1989. He was also a director / shareholder of Svarna Artha Interbuana, Jakarta from 1989 until 1991. In 1991, he was miraculously cured from leukemia. Since then, he had dedicated himself in the search of ancient local wisdoms and spiritualities from various places and traditions in the world. In the same year, he founded Centre for Holistic Health and Meditation, it was called Anand Ashram Foundation. This centre has been affiliated with The United Nation since 2006. 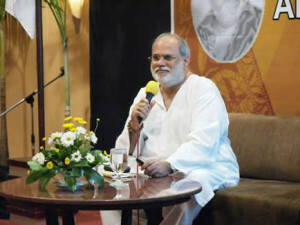 His comprehension and experiences in learning and practicing various meditations techniques from many traditions and cultures in the world have inspired him to devise various programs in self-empowerment, self-development, and holistic-health to achieve full potential in health, happiness and to betterment in personal relationship. These programs are available in One Earth Retreat Centre, Ciawi, and other centres. Thousands have joined in and experience the benefits from these programs since 1991. One of the most popular is Laughing Theraphy which is conducted by Laughing Club every Sunday morning fortnightly at Monas, Jakarta. This program is free and everyone from various background of life can join in. There is also Free-Healing thru Neo Zen Reiki Program conducted every Sunday morning in Car Free Day (CFD), Jakarta. Since 2000, Anand Krishna had also founded One Earth Retreat Centre in Gadog, Ciawi, West Java to focus on Centre for Wellbeing and Self-Empowerment. Here, participants have opportunities to be free from their hectic life, and experience the life of meditativeness by joining various meditation programs. In turn, participants may also experience betterment in their health. The centre facilitates and caters for participant who is willing to start his/her #InnerJourney to find his/her true self. All sort of mediation techniques from various cultures were adopted in the centre to achieve Holistic Health,True Happiness, Body & Mind Balancing, Soul Enhancing, General Wellbeing, and the Betterment of personal relationship. Anand Krishna also inspired various other organisations in local and national organisation in field of education and health in many areas nation wide, such as Jakarta, Ciawi, Kuta, Jogjakarta, and Semarang. Recently we have newly establish in Ubud, Bali. These centres are also known as Anand Krishna Center (AKC).